As I noted last week I have purchased a 3D printer to use as part of my hobby. The Wanhao printer arrived from 3Design on Monday and last evening I cracked open the box. It took Tom and I about 25-30 minutes to get it set up and the bed levelled to a point where we could make the first print. This little octopus is 6cm from tentacle tip to adjacent tentacle tip. There is some graining and I need to read up as to why that is. In most cases it is recommended that you treat the prints with acetone to remove the ridges. After the octopus I tried to print one of the Winterdale walls from Printable Scenery. It took me a while to work out how to do it. I had to download the Wanhao Cura software off their website and then imported the Winterdale "Walls" file in. This is their Short Wall which is approximately 8cm long. It took approximately 40 minutes to print. I have cleaned it up but was happy with the result as proof of concept. The next few nights I intend to play around with settings to try and fine tune the output. If there are any 3D printers out there I'd certainly appreciate feedback/comment on the prints/mistakes I'm making/what I should do post-production. The wall is very nice - cost wise other than purchasing the printer how does printing out your own scenery like this compare to buying it? Wall looks good. 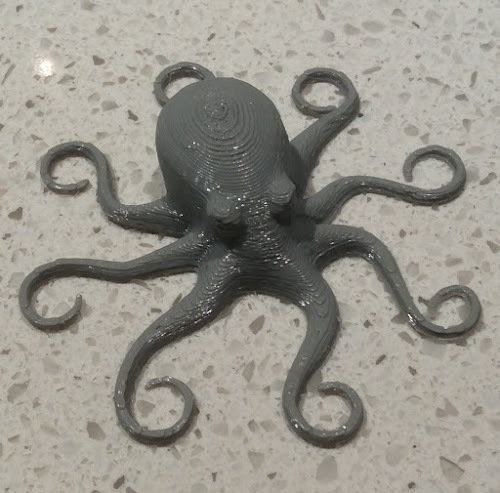 I can see how the granular nature of the print works better on something like bricks or rocks than on something as smooth and organic as an octopus. How brittle or durable is the end product? What material are you using for your printing? Thanks. That's what I use as well. Does acetone help in smoothing out the print artifacts? I didn't use any solvent in the end. Just a brush and clippers. Long Game? Or Incredibly Lucky?